Let me explain exactly what I mean by that. Although the American Hockey League will recognize the Norfolk Admirals as the defending Calder Cup Champions, the entirety of the 2011-2012 team’s roster and coaching staff has packed up and moved to Syracuse. After setting a professional hockey record last season with a 29-game winning streak, the players from one of the best AHL teams of all time now make up the Syracuse Crunch. Defending AHL MVP Cory Conacher and breakout goalie Dustin Tokarski join the team under head coach Jon Cooper for the 2012-2013 season. In a nutshell, the Lightning had to either extend the Admirals affiliation for another two years or simply move on to another organization. After signing a multi-year deal with Syracuse, the team will now be much closer to the rest of the AHL teams in the northeast, cutting down on travel costs and fatigue. The Bolts effectively swapped teams with the Anaheim Ducks, who are now affiliated with the Admirals. While the Scope in Norfolk gets the banner, it is the players on the Crunch who set out on a title defense. The Admirals now have nothing to prove while the Crunch will try to assure that they are one of the best teams in the AHL. It may be difficult in the early going, as their first seven games entail two back-to-backs as well as three-in-three road trip. After going 1-1 in their first back-to-back, the Crunch are now right in the midst of their three-in-three challenge. They beat the Albany Devils 3-2 Friday night, led by a strong performance from Tokarski (25 saves on 27 shots). 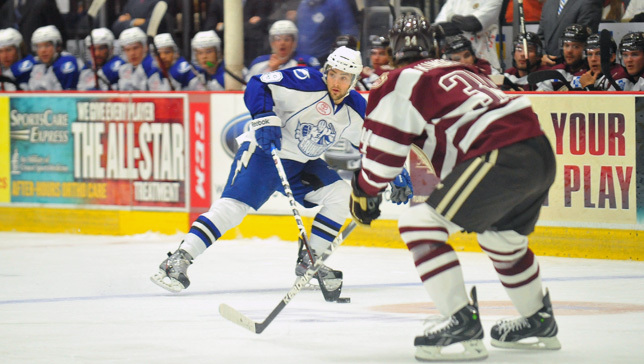 Lightning prospect Cory Conacher controls the puck against the Bears’ defense. The Crunch plays the Binghamton Senators on Saturday night before finishing off the set with a game against the Wilkes-Barre/Scranton Penguins on Sunday. NOTES: The Crunch have earned at least a point in each of their first three games (2-0-1)…Left wing Cory Conacher was named the CCM/AHL Player of the week for the first week that ended October 14, racking up five points in two games…Net minder Riku Helenius won on October 13 for the first time since December 12, 2009.